Ketamine and propofol, two popular anesthetic agents, are generally believed to operate via disparate primary mechanisms: ketamine through NMDA antagonism and propofol through the potentiation of GABAA-gated receptor currents. However, surprisingly the effect of ketamine on the EEG is markedly altered in the presence of propofol. Specifically, while ketamine alone results in a downshift of the peak frequency of the alpha rhythm, and propofol keeps it roughly constant - when administered together, they increase the alpha peak frequency . Recently it has been found that both ketamine and propofol inhibit the hyperpolarization-activated cyclic nucleotide-gated potassium channel form 1 (HCN1) subunits, which induces neuronal membrane hyperpolarization . Furthermore, HCN1 knockout mice are significantly less susceptible to hypnosis with these agents; but equally affected by HCN1-neutral etomidate . We show here  that an established mean field model of electrocortical activity can predict the EEG changes induced by combining ketamine and propofol by taking into account merely the HCN1-mediated hyperpolarisations, but neglecting their supposed main mechanisms of action (NMDA and GABAA, respectively). See Figure 1. Predicted shift of the alpha peak frequency of ten parameter sets during four phases of linear change to the normalized ketamine (K) and propofol (P) concentrations, respectively. Our results suggest that ketamine and propofol are infra-additive in their HCN1-mediated actions. This is consistent with independent experimental evidence. 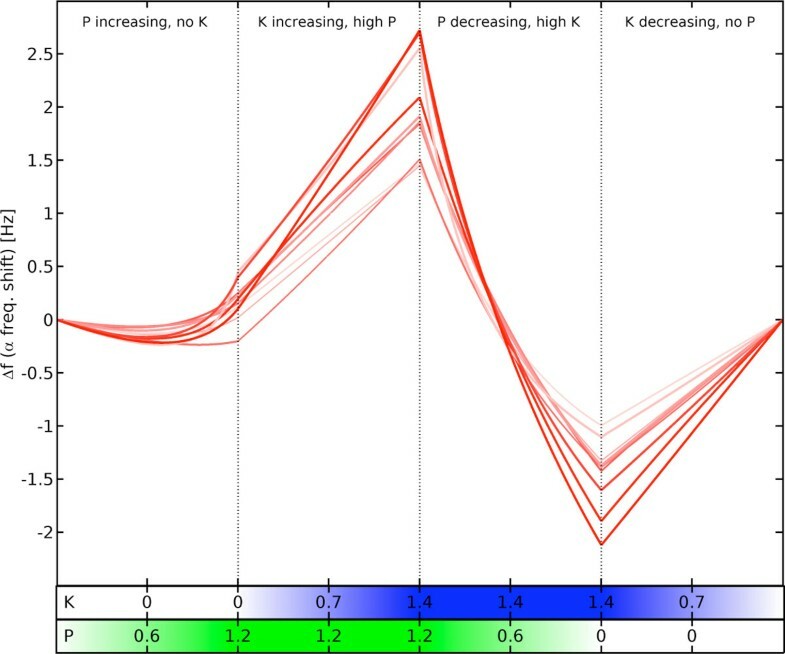 We show here that the HCN1-mediated actions of ketamine and propofol, hitherto neglected by models of anaesthetic action, can not only explain a range of counterintuitive induced EEG changes but also predicts the infra-additivity of these drugs.